SIZE: 4 5/8" X 3 11/16". Son in law of Nicolas Sanson (aka: Sanson d'Abbeville), Duval published an amazingly large number of works between 1651 and his death. Except for a few individual maps in a large folio format, most of his productions were diminutive pocket size atlases. 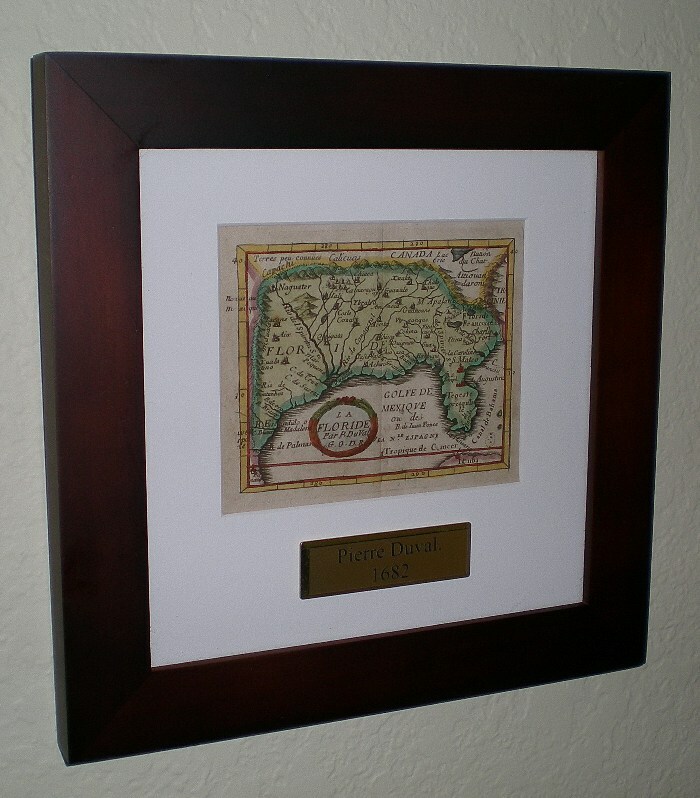 His contribution was more to dissiminate geographical knowledge, than to advance the science of accurate cartography. In a sense, he preceded Alain Manesson Mallet on the French geography digest market. 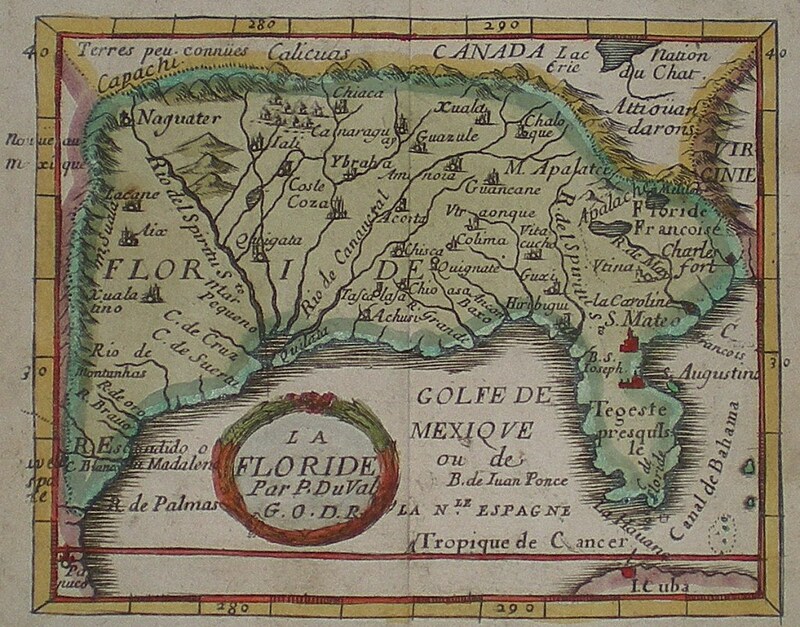 Of note: the 1651 "Table geographique de tous les pays du monde", the 1672 "Cartes de geographie les plus nouvelles", and the 1682 "Géographie Universelle), re-issued in 1691 and 1694. Géographie Universelle. Its printing date is not known. The delineation is very much in line with the 1656 and 1657 Sanson seminal maps. It exhibits also the same topographical errors, the wrongly located mouth of the Mississippi (Spiritu Santo River), the fantasy hydrography (mythical lake source of the St. John River i.e. R. de May). 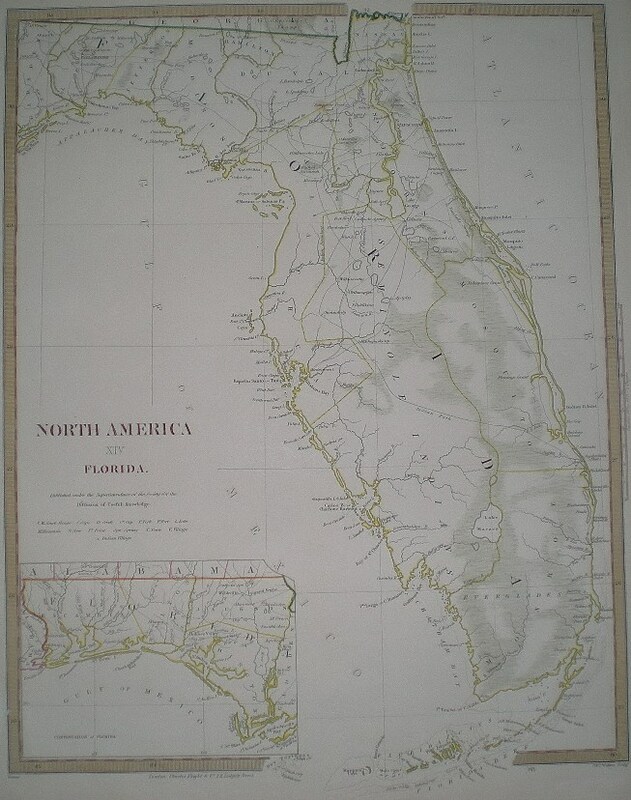 Notice also that by that time, present day Florida was known as the Tegeste province. The cartouche shows that by that time duval had been promoted to Geographer to the King (G.O.D.R or Géographe Ordinaire du Roi).